In my last outfit post, I showed you guys my Public Desire perspex heel patent boots (aka the greatest boots ever). As promised, I styled them with a more casual outfit so you can see how well they work with a different look. 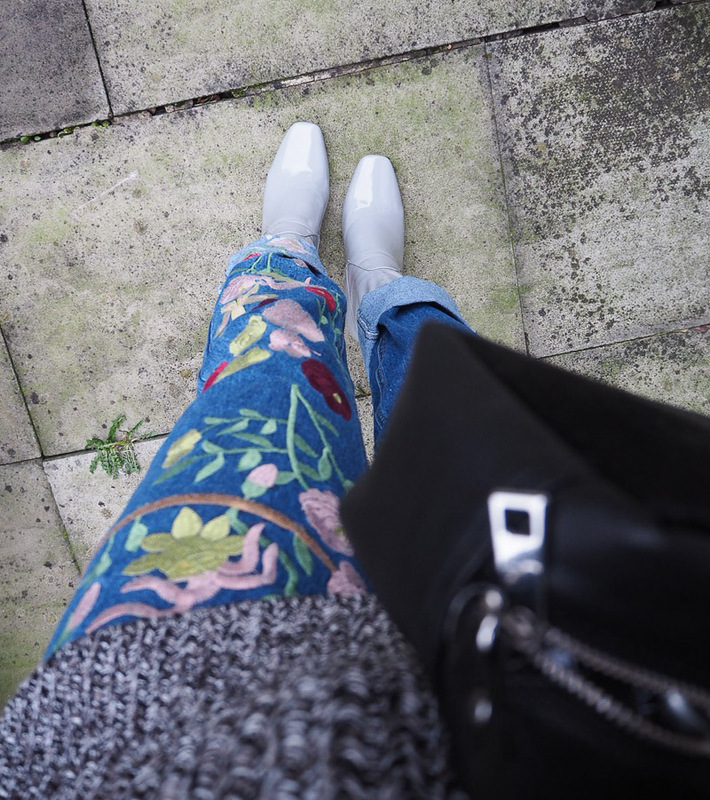 As far as I’m concerned, these floral embroidered jeans are basically THE jeans of the new season. It seems that others agree too because unfortunately they keep selling out instantly. They’re from Glamorous and the ones I’m wearing are Tall, but they come in various options. 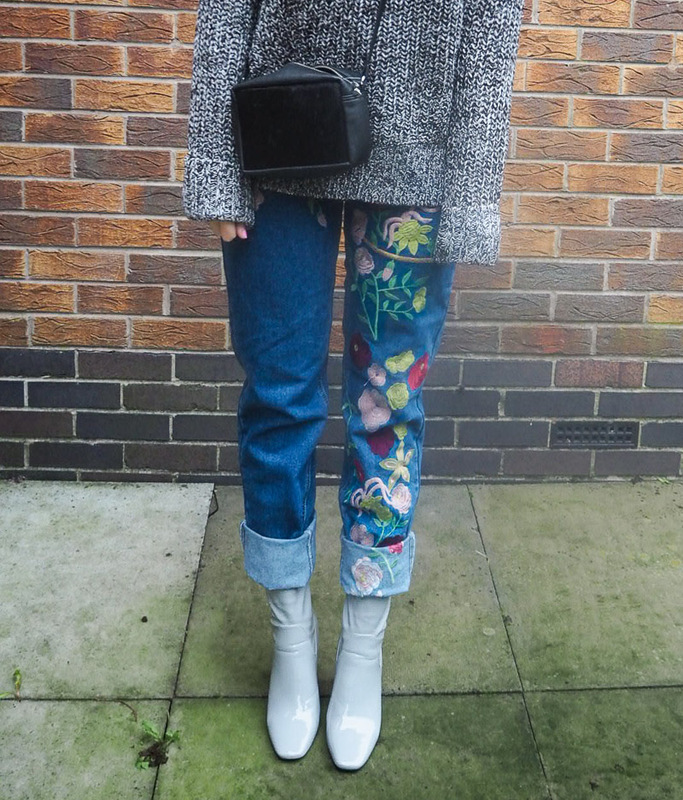 Topshop have done some similar, equally amazing floral embroidered jeans but they’re currently sold out online, although I believe some stores have still got them in. I’m 5 ft 8, so I can usually get away with either regular or tall jeans, and at the time I bought these there was only the tall version available. They’re actually a lot longer than I had thought. I’d already planned on wearing them with the hem rolled up as I think they look better that way, but I had to roll them up more than I’d anticipated. They’re a girlfriend style with a high waist and the embroidered pattern on them is just gorgeous. Full disclosure, I only wore these jeans to take some outfit photos. I’m actually devastated as I think I might have to return them. I think they’re absolutely incredible, but they just don’t fit me right at all. Jeans never do. It drives me mad. So if you ever wonder why I don’t wear jeans, that’s why. But I do love their easiness so if I can’t keep these I will be continuing my hunt for a well-fitting pair. I know full well though that they’re not going to be anywhere near as good as these, so I don’t know what to do yet. To complement the grey boots, I’m wearing an oversized grey tweed effect jumper. It’s so chunky and cosy, and keeps the outfit from looking too done. Knitwear, especially of the oversized variety, has that ability. 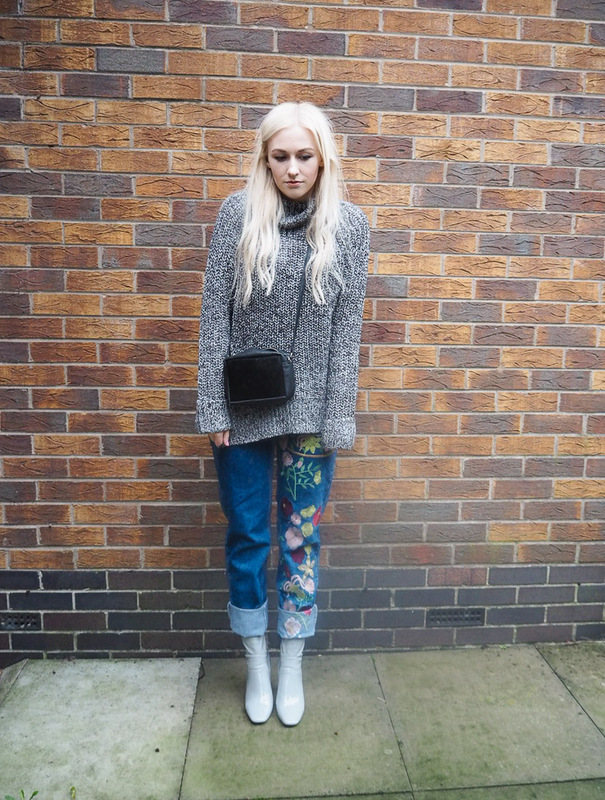 Even with jeans and boots as special as these, a big jumper makes the look laidback. 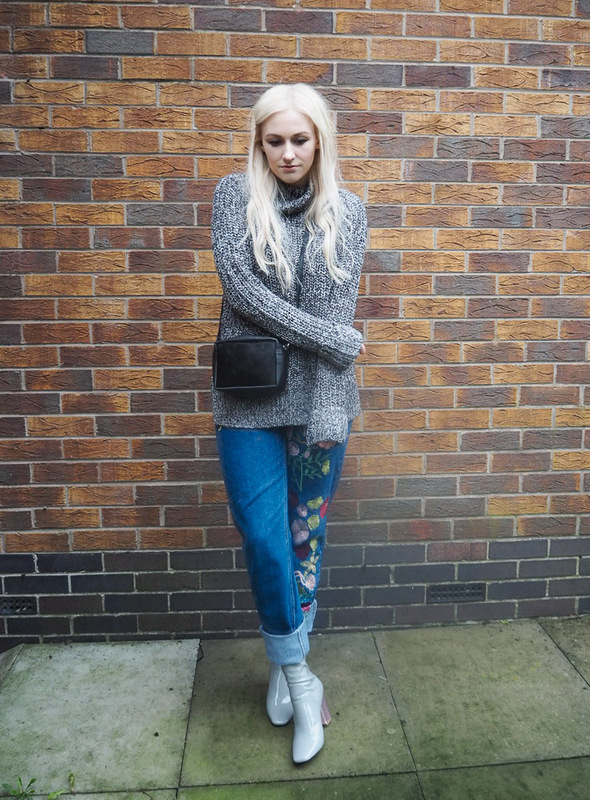 Worn with a simple black cross body bag and this casual outfit is ready to go. Such a stunning and gorgeous outfit that suis you so well! 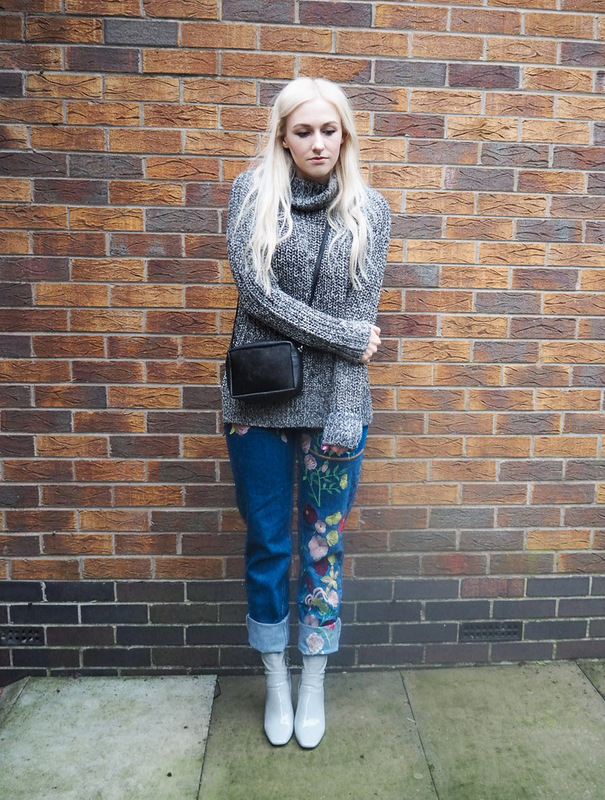 In love with the floral print on your jeans! Sad to hear you had to return them! They look fantastic :) I feel your pain ! I only have one pair of jeans, it's so hard to find a pair that fits!